A debt relief plan sounds simple, doesn’t it? And, from a practical point of view, it is. Those steps are outlined here for you to follow and create your own plan. What’s not so simple is maintaining your focus and motivation. Take a look at this post for some techniques to lift your spirits when it all seems too hard and you really want to go splurge on shoes (or books or takeaway). Commitment and belief are the keys to your success. Always. In all things. 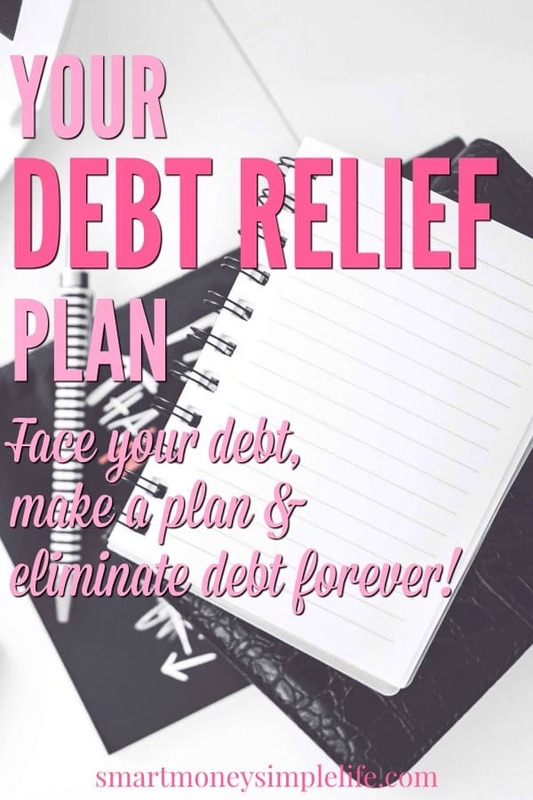 I prefer to describe demolishing your debt as a debt relief plan rather than a debt repayment plan because it focuses on how you’ll feel when the debt is paid; relief. It might seem like semantics but, the name you give something has power. It can colour your thoughts and feelings in surprising ways. You can, however, use that to your advantage. It’s also a great way to keep your focus on the benefit of what you’re doing rather than the week in, week out grind of making payments toward your debts. In a hurry? You can skip ahead by clicking here. Yes, it can be a little scary. Maybe a lot. But… Be honest. List all your debts. Don’t skip anything, it all counts. As they say, the first step to resolving a problem is admitting you have one. Money owed to family or friends. Once you’ve got all your debts together, grab a fresh sheet of paper (or an excel spreadsheet) and list them from lowest balance to highest. Now add the interest rate being charged and the minimum monthly repayment along side each item on your list. Generally, your mortgage will be the largest debt but it could be your student loans. Don’t make any judgement calls on which should be paid first. Just look at the numbers. Once you’ve got the facts laid out in front of you, you can start to create a plan. Here are some excellent tools to help you create your plan. It’s easier to hit a target if you’re aiming in the right direction. That’s why it’s important to prioritise your debt repayments and set some goals. Just deciding that your destination is to get out of debt is not enough, you also need to plan your trip and choose your milestones. So, as you’re considering your goals, think about them in terms of a time line. Long term = 10 years plus. Which is better? The best choice depends on whether you prefer: getting quick wins or paying less in the long run. You can learn more about these debt repayment methods here. Do you need see quick results to stay motivated? Do you want a simple way to eliminate debt, not a complicated number crunching exercise? Have you tried other debt repayment methods and not followed through? Do you have the discipline to continue paying off debt even when progress seems slow? Are you a number cruncher? Are you happy to take defer gratification if it ultimately means paying less money toward debt? Regardless of the approach you take, the process is mostly the same; once a debt is paid off, roll that payment into the next debt to be paid. As each debt is repaid, your payments will snowball and you’ll begin to see real momentum in your progress. Once this happens, you’ll know your debt relief plan is working. If any debts have gone into default, tackle them first, these are your short term goals. Just focus on maintaining other debt until you have the default accounts back in good standing then start either your snowball or avalanche efforts. Note: If you have debts or bills in arrears, tough as it might be, call the companies and let them know you plan to get the debt back in good standing within a set amount of time. Pay your debts when you get paid. Most interest on debt, like credit card debt, is calculated daily, that means the more often you’re paying it down, the less interest you’ll pay. Always a good thing. It might seem counter intuitive, but once all your debts are in good standing, consider allocating funds toward your $1000 emergency fund. Having an emergency fund can save you going into debt (or adding to your debt) when the unexpected plonks itself on your doorstep. Start with any debts that are in default. Save on interest by making debt payments each time you receive your pay cheque. Focus on one debt at a time. Just pay the minimum on all other debts except the one you have chosen to focus on first. When one debt is paid off, apply that payment to the minimum payment being made on the next debt on your list. If you don’t have an emergency fund, make payments toward creating a $1000 fund. Step 5 – Make sure you celebrate each and every time you pay off a debt. High-fives. Bake a cake. Do something special for yourself and your family. Whatever it is, it needs to give you the opportunity to acknowledge your achievement. If you have a family, they need to be part of the celebration, too because their ongoing support is vital. 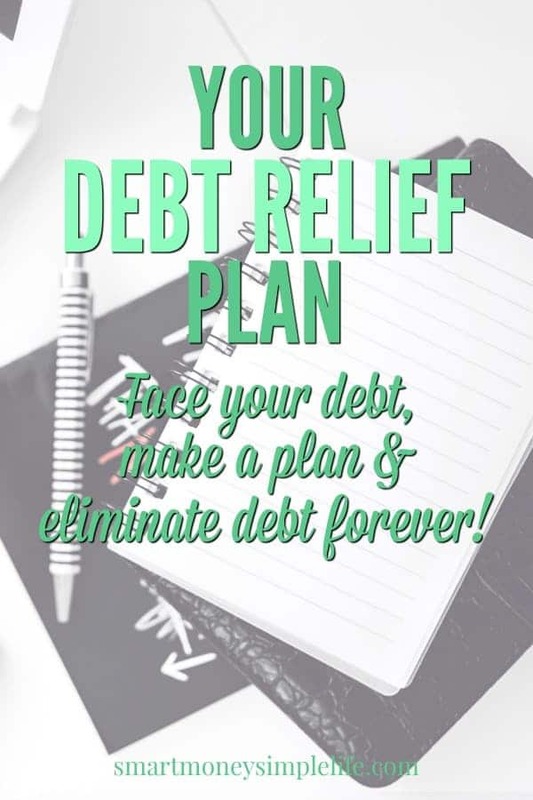 Are you ready to face your debt, make a plan & eliminate debt forever? Then don’t delay, start now. It might be a hard slog. You might have to sacrifice some little luxuries along the way but there’s no doubt about it; being debt free is an incredible feeling. Take control of your money and take control of your future. Are you working on paying off your debts? Do you snowball or avalanche or a bit of both? What have you found helps keep you on track?